If there’s anyone who can tell you what it feels like to have months of hard work pay off and culminate in a single moment of euphoria, it’s Jason Wei and his teammates Hayden Do, Chris Duan, and Derek Zhu from Team Estimeet. 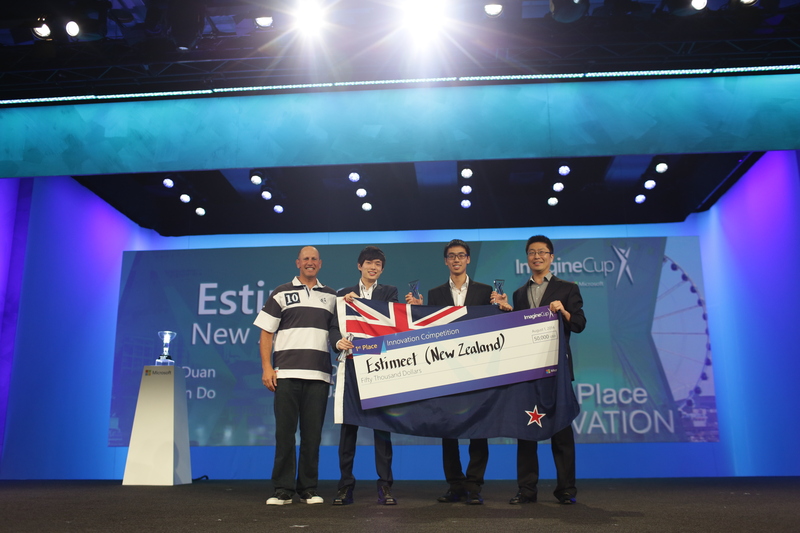 This is the story of four amazing students from the University of Auckland who, powered by a brilliant idea, passion for what they do, and a relentless work ethic, won the Innovation category at the 2014 Imagine Cup Finals in Seattle, Washington. “It took us a moment to process that and it was only when he said ‘Estimeet from New Zealand!’ that we leaped from our seats,” Jason describes. It’s a special feeling, indeed, to not only be judged but recognized by the likes of Satya Nadella, CEO of Microsoft, and Erik Martin, founder of Reddit, carrying a huge New Zealand flag up proudly to the world stage and shining amongst peers representing the cream of the crop of their respective countries. We had a chance to speak with Jason when the Imagine Cup finalists were presenting their projects at Microsoft’s Redmond campus, and were immediately wowed by the functionality, polish, and usability of the app. Estimeet is an app that solves a real social dilemma by saving a lot of headaches when meeting up with friends. By allowing you to easily create an event and add your friends, you can see their real-time location and estimated time of arrival so there’s less guessing and waiting (see video for a quick demo from Jason). “Friends being late and not letting you know is such a big issue that we just accept as part of our daily lives. Being able to step up and come up with an idea that solves this widespread problem (which affects everyone!) and developing the actual app is definitely the most rewarding thing,” says Jason. The very intuitive nature of the app, however, is perhaps what makes it so innovative and what landed the team the top prize in this category. As Steve Guggenheimer (Chief Evangelist for Microsoft) put it prior to announcing Estimeet as this year’s winners, “with innovation, you don’t always know what you’re looking for, but when you see it, you’ve found it.” And while combining a real world problem with creative thinking and technical prowess may give you a great idea for an app, it’s hard work that’s the real catalyst behind success on such a huge stage. “We’ve really put everything into Estimeet as a project- six months of constant hard work and refining the app and presentation- to be recognized and rewarded is really satisfying and motivates us further to move ahead as a start-up. Hard work really pays off.” It’s difficult to summarize the blood, sweat, and tears of half a year in a single sentence, but for Team Estimeet, all that hard work took them to the moment they stood up on that Imagine Cup Finals stage on August 1st. This entry was posted in Imagine Cup, Information. Bookmark the permalink. We’d love to hear your thoughts on Team Estimeet’s story, and how students around the world are being empowered by technology and creativity to solve problems they see every day– join the conversation below!